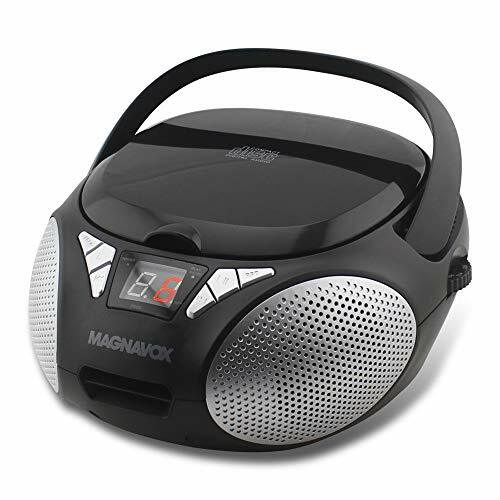 Enjoy your music with the Magnavox CD boombox with AM/FM radio (MD6924). featuring a compact, portable design. 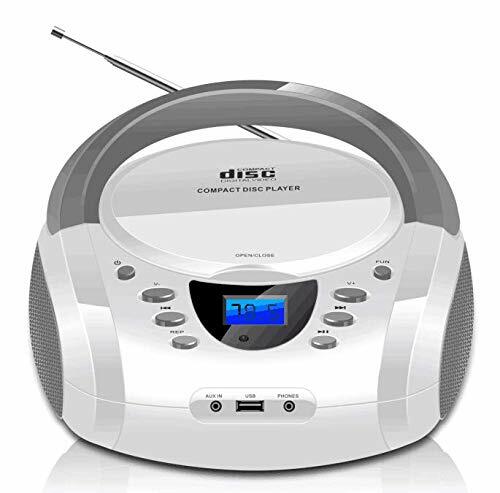 It is equipped with a top-loading CD player, so you can listen to your favorite CDs, including cr-rs and CD-RWs. The built-in AM/FM radio allows you to listen to local radio stations and sports games at home or on the go. A 3.5mm aux input allows you to connect the Magnavox CD boombox to virtually any audio source as well as an AC/DC operation (adapter included) powered by 6 C batteries (not included). 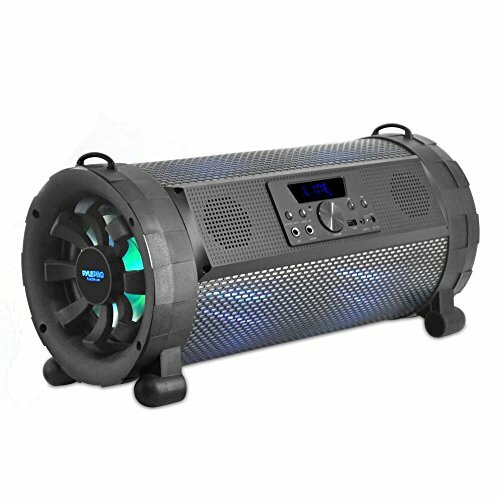 This portable stereo with 2 x 0.8W RMS output Features an LED display that makes it easy to see which CD track is playing. Magnavox celebrating 100 years of sound and visual Quality The Magnavox brand originates back to 1917 when the worlds first moving coil speaker was invented in a lab in Napa, California. Due to this invention for the first time in human history the world witnessed a human voice that could be heard by an entire town. 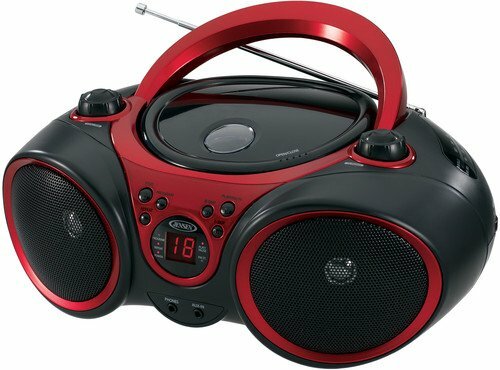 KEY FEATURES: Enjoy your music with this top loading Magnavox CD boombox with AM/FM stereo radio. The aux input allows connection to any device. 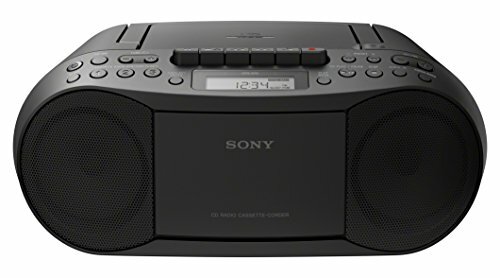 The boombox is CD-R/CD-RW compatible and has an AC/DC adapter. It's powered by 6 C batteries (not included). QUALITY: We are committed to making products to meet the needs of our customers. For all of our high-tech devices, we strive to make quality products at the lowest prices. All of our products are built using high-quality materials for long-lasting use. PERFORMANCE: The Magnavox brand is ubiquitous on popular products found in households around the world. Even in today's rapidly changing markets consumers continue to choose our products to enjoy the values it stands for; high performance at smart price. 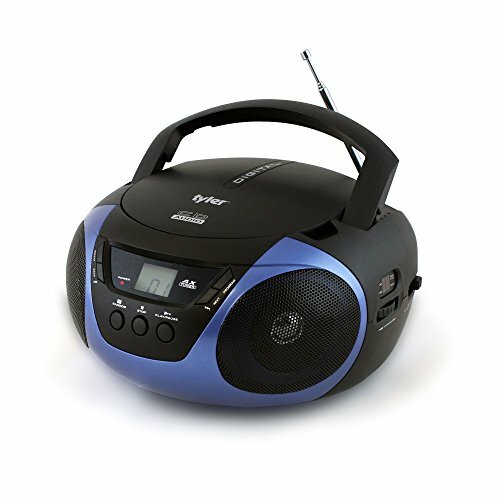 The TAU101 Portable CD Player with AM/FM Stereo Radio from Tyler is the perfect way to take your tunes on the go! Choose from 3 color options to show off your personal style! 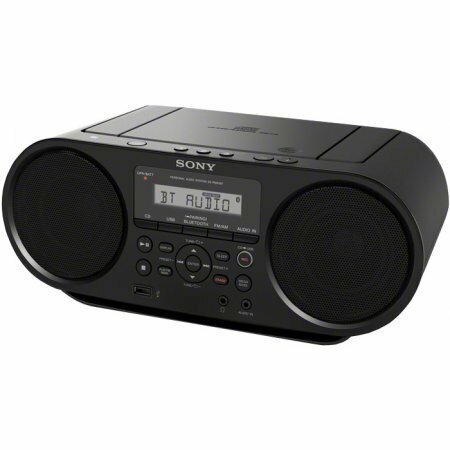 Product Features: AM/FM Stereo Radio. Top Loading Soft-Open CD Compact Disc Player. 16/19 Track Programmable Memory. LCD Display. Play/Pause, Skip/Search and Repeat Functions. One-Touch Random/Shuffle Playback Function Telescopic Antenna. Stereo Headphone Jack (3.5 mm) Built In, Auxiliary Input Jack (3.5 mm) Built In. Dynamic High Performance Speakers. 2 Way Power: DC Battery Power and AC Power. ETL Listed. Stereo speakers deliver an enjoyable listening experience. 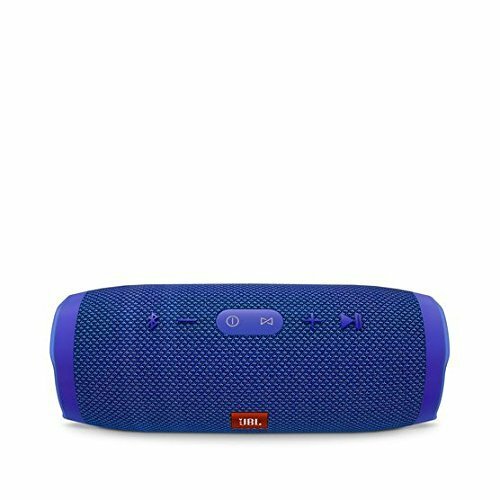 Enjoy your favorite music on the go (6 size C, sold separately). For battery swaps that are a snap, the battery compartment quickly and easily clicks open and closed. Enjoy your favorite CDs or personally recorded CD-R and CD-RW discs. Complete with headphone jack and AC power cable, the TAU-101 is ready to go when you are. 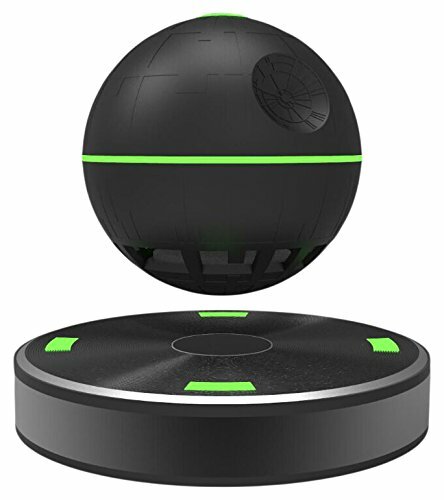 Tyler's mission is to develop the finest quality consumer electronics products that embrace the latest technological innovations guaranteed to provide consumers years of personal entertainment pleasure. 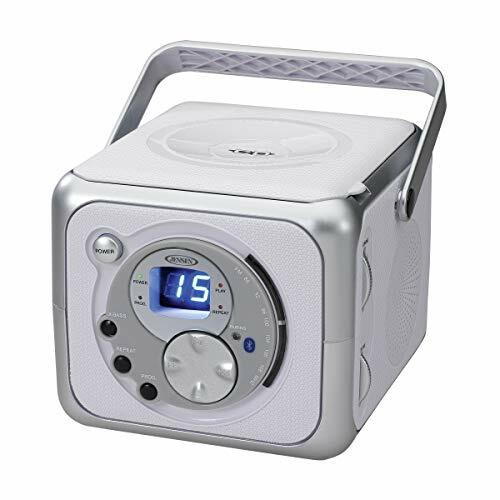 The GPX BC112 Portable Boombox comes with a top-loading CD player that has a 20 track programmable memory and can play CD and CD-R/RW discs. The 2-digit red LED display makes it easy to see what track number is playing. A direct tune AM/FM radio with telescopic FM antenna and built-in AM antenna make this music system perfect for people on the go. 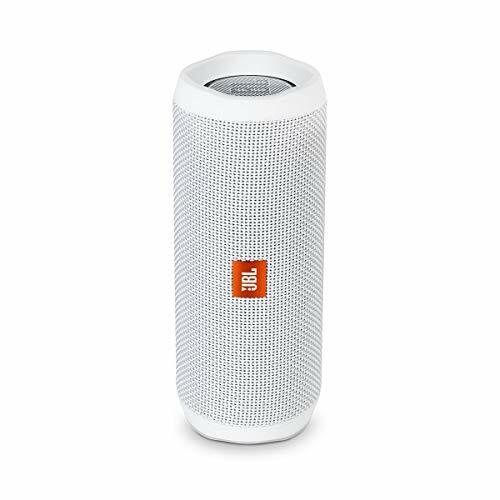 A 3.5mm audio line input and built-in speakers allow users to play their favorite songs direct from their MP3 music devices. 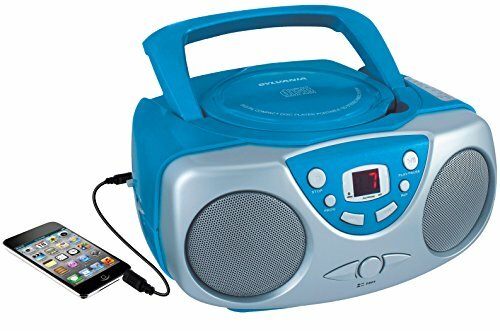 Each Portable Boombox comes standard with an AC power cable (included), or can operate cordlessly with 6 C batteries (sold separately). Included in the box is the Boombox, AC power cable, warranty card and a user's guide. For more than 30 years, GPX has offered one of the broadest portfolios of technology-driven consumer audio and video products. An award-winning consumer electronics company, GPX has built a solid reputation on excellent product quality, reliability, design, and affordability. 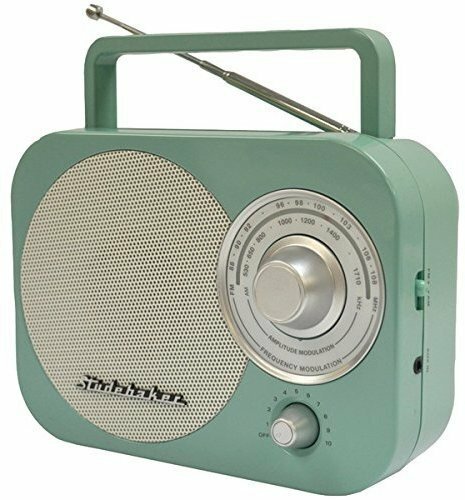 The Studebaker Portable AM/FM Radio (Teal) is the perfect addition to your bedroom, living room or kitchen. Tune into your favorite station or hook up your MP3 player or iPod with the auxiliary input to play anything from your personal music library. Plus, with 4 C batteries, you can take this radio anywhere. Music Port on Front Panel for Digital Audio Player Playback. Natural Surround & High Quality Sound with MP3 Re-Master & Sound Virtualizer. Convert all your systems into compatible Bluetooth devices! Now here's a great piece of kit to take you right back to the old days. Play those old CDs or just tune into the radio for your favorite sounds. 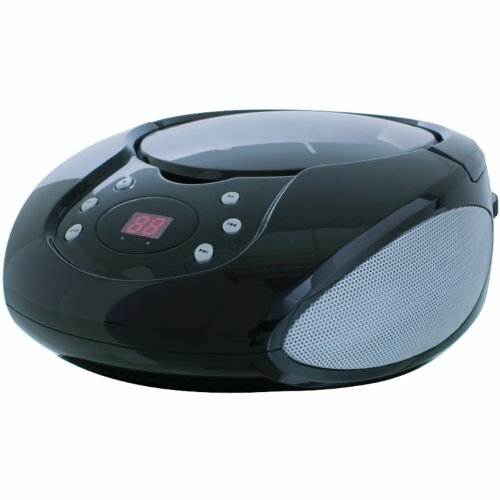 It's a personal CD player, a radio CD player all in one great package. The cool look of this boombox CD player will transport you back in time. The fantastic style grills optimize the sound and give a feeling of those great old days when music came alive. Just think of classic American cars and driving down the highway to your favorite sounds. But the technology inside is right up to date. 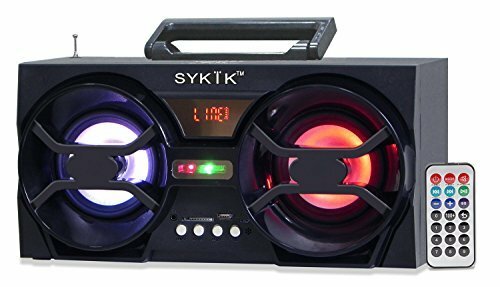 With this portable boombox you can get your sounds in a variety of ways. It plays non-MP3 CDs and radio. But there's more. Via the aux-in socket you can connect your tablet, smartphone or MP3 player to get all the latest sounds too. And the built in LED display keeps you in control of the action helping you select your tracks. Or there is 20 track pre-programming if you prefer to let the machine do the work. 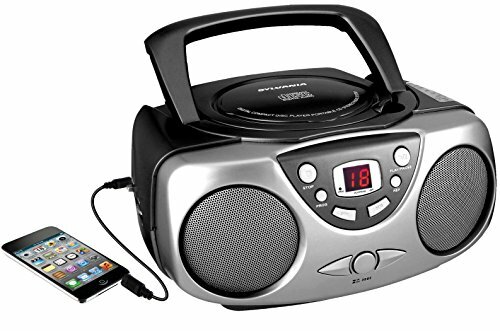 The portable boombox is CD/CD-RW compatible, has an FM radio and is equipped with a 3.5mm aux-in socket to connect smartphones, iPhones, iPods and tablets so you can play MP3s. There are two speakers and the CD boombox comes with an AC mains adaptor. Boombox also have usb and 3.5mm ports for better experience. And what about us at Lonpoo? The Lonpoo brand was created in 2006 with the aim of supplying desirable, stylish audio related products at affordable prices. Our range of products is constantly updated and currently includes classic portable stereos, dvd players and sound bars. 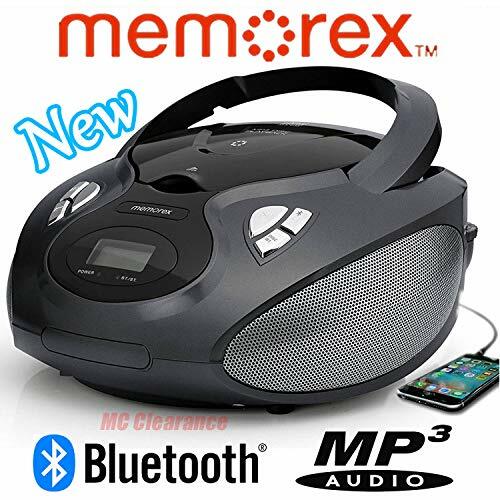 The Memorex Portable Multi-Function Bluetooth CD AM/FM Radio Boombox combines traditional music playback modes with today's Bluetooth wireless streaming of audio. Simply pair and play audio from any Bluetooth-enabled music devices, digital music player, smartphone, tablet or computers or connect to any device with a standard 3.5mm audio output. Play your CD/MP3 collection or listen to your favorite AM/FM stations for music, news traffic, weather and more. Play it loud or play it privately through the headphone jack. Sounds so good, it's hard to tell if it's live or if it's Memorex! When you hear the Sylvania name, immediately you think of quality built, affordable electronics. Well the folks at Sylvania are at it again. 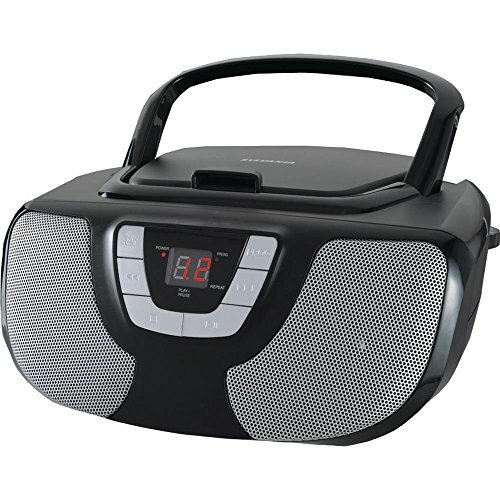 Introducing the SRCD1025, Portable CD Radio Boom box! 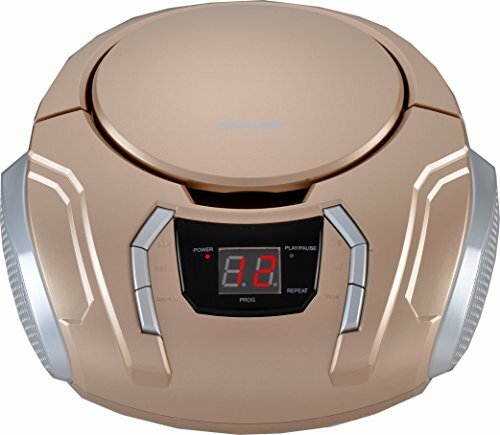 Sylvania stepped up their game as they introduce this Boom box that will be perfect for any occasion! 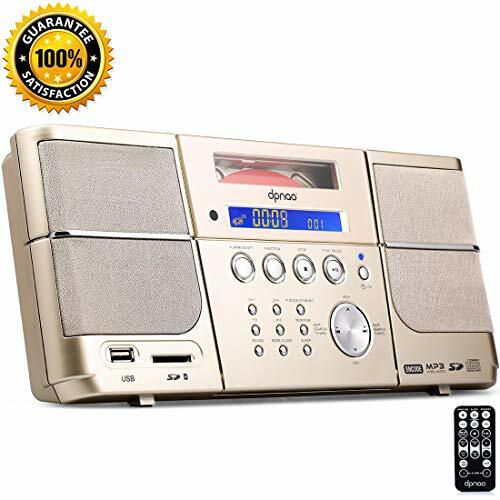 It has a top loading CD player with an LED display for your favorites mixed cd s, or you can listen to your favorite station with AM/FM radio tuning. If you re planning a big party and made a playlist on your iPod well you re in lick because it has an AUX-IN jack, and it has 20-track programmable memory. All this from the makers at Sylvania, the #1 leader in electronics! and get ready to groove. Crank up the volume and break out all of your old favorite CDs! to navigate from channel to channel in seconds. The built-in handle makes it easy to move the unit from room to room or even to the backyard for an outdoor dance party. Five EQ modes ROCK/ POP/ FLAT/ CLASS/ JAZZ. FM radio, FM Auto Scan, can keep 20 radio stations at most. 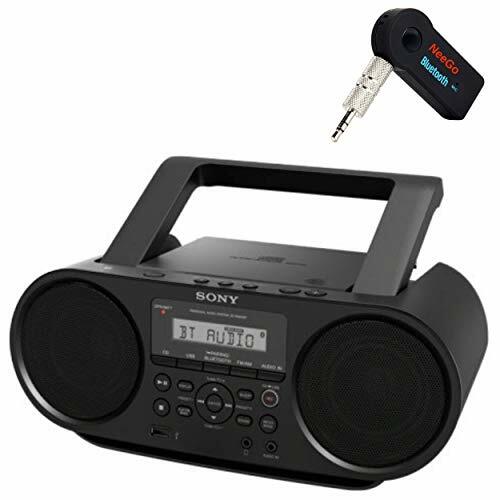 Variety of Audio Modes & earphones Output Support FM radio/ USB / AUX-IN input, A key switch, easy to use. 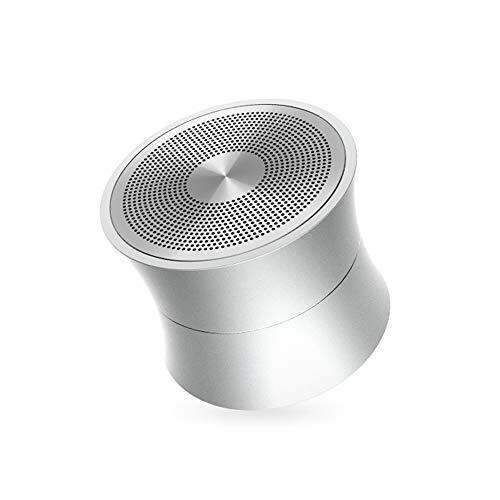 Support headphone jack output from CD player, enjoy your favorite song in private, will not disturb other people. 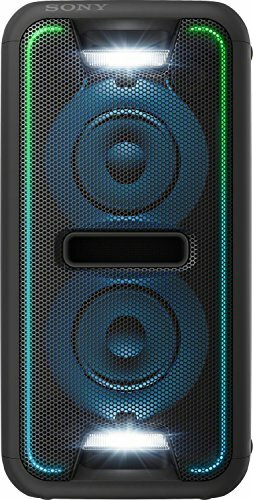 High configuration & Multi-function Full lcd screen display, Stereo speakers,Big Knob for Volume, Electronic digital buttons, Previous / next song, Auto-stop (recording playback) function. Wide range of applications Suit for a variety of places Studying, family party, Valentine's date, personal leisure, Dance, fitness,Outdoor activities, and so no. It's a good gift for kids, elders, famliy and friends! 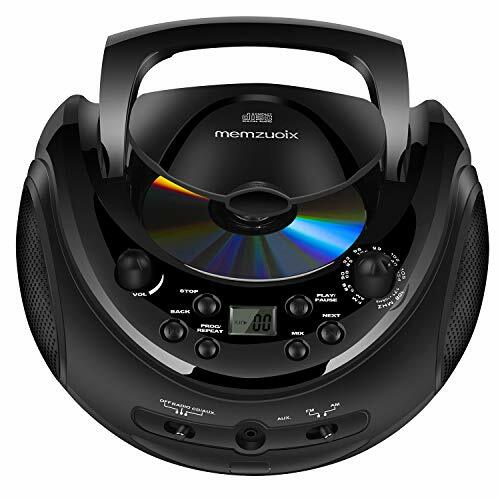 Memzuoix Portable CD Player Boombox has unique fashionable design, and provide you a cost-effective way to enjoy your tunes in multiple formats. 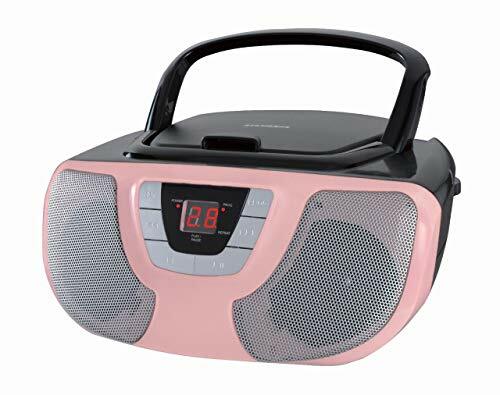 This portable sound system let you access to the AM/FM radio, CD-R/CD-RW playback, the option to connect your audio devices via the stereo 3.50mm mini-jack audio input.